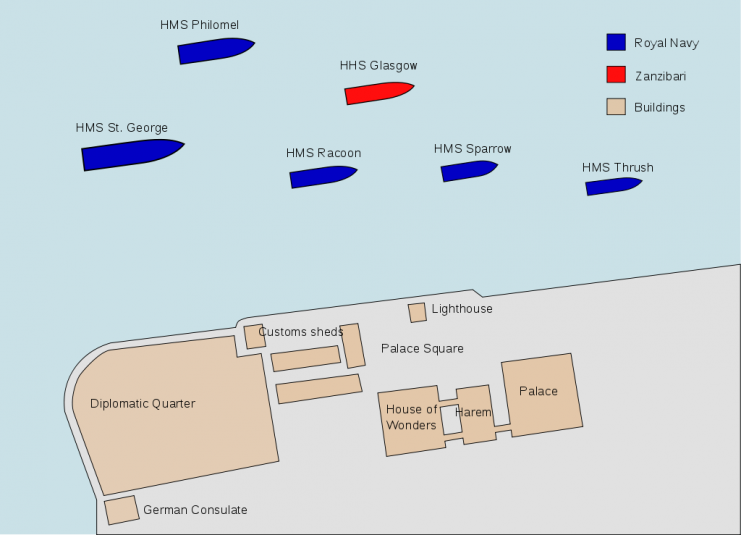 The five British warships pounded the palace in unison. War is generally a protracted affair, dragging on for years and involving multiple battles, invasions, movement of armies across vast distances, and back-and-forth threats and negotiations every couple of months. In rare cases, though, a war can start and finish in a matter of months. Rarer still are some wars that last only a few weeks. But what about a war that lasts, say, only a few days? Such a war would surely count as the shortest war in history, right? Wrong. The shortest war in history lasted all of thirty-eight minutes. 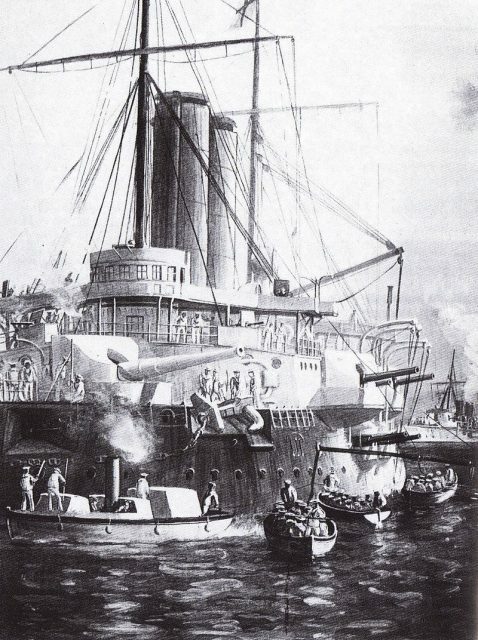 This record breaking war – one of the strangest records in the entire history of warfare – took place in 1896 between Great Britain and Zanzibar, and ended with a very swift British victory. Before examining the details of these thirty-eight minutes of nation versus nation conflict, it’s useful to take a quick look at the backdrop against which this war took place. The Scramble for Africa is a name given to the period between 1871 and 1914, in which a number of European powers all engaged in rapid, aggressive colonization on the African continent. Powers like France, Britain, Germany, Belgium and Portugal all lay claim to vast swathes of territory. While local rulers could sometimes be tricked or bribed into handing over large parts of their kingdoms and chiefdoms to European powers, often this land was taken at bayonet point. By the final decade or two of the 19th century, the primary European powers in East Africa were Germany and Britain. 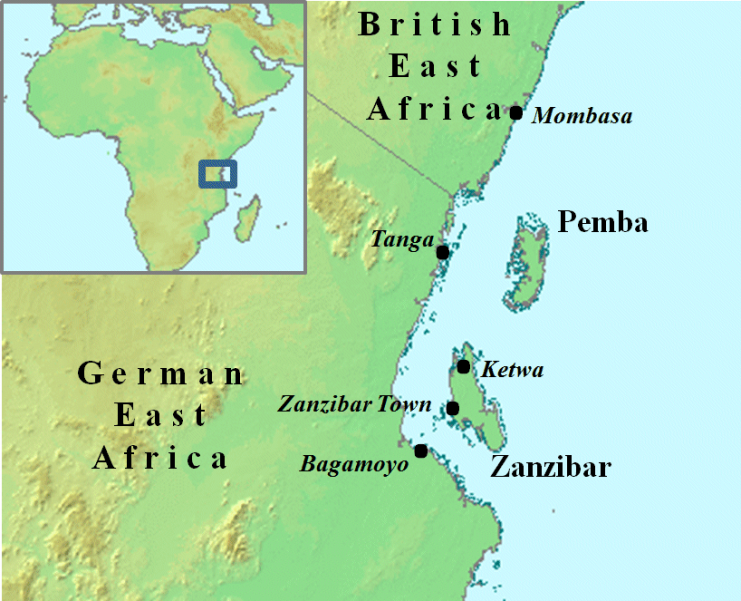 Through the Heligoland-Zanzibar Treaty of 1890, these two powers agreed to a deal in which Germany controlled Tanzania, while Zanzibar, a large island off the coast of Tanzania, was ceded to British control. Zanzibar thus became a British protectorate. Once the British had gained this control over the territory, they installed a puppet ruler as sultan: Hamad bin Thuwaini, who had long been a supporter of theirs. From 1893 to August 1896, Thuwaini did a decent job of “ruling” Zanzibar, but the island was thrown into turmoil when he died, very suddenly and unexpectedly, on the 25th of August. Within hours his cousin, Khalid bin Barghash, had taken the throne and had named himself Sultan of Zanzibar – without saying a word about this to his British overlords. It has never been proven, but Barghash was suspected of poisoning Thuwaini so that he could seize power. 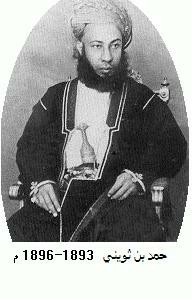 Hamad bin Thuwaini of Zanzibar. It came as no surprise, after this sudden cascade of events, that the British colonial authorities were enraged at what Barghash had done. The seeds of conflict had been sown, and it wouldn’t take long for things to come to a violent head. Basil Cave, the most senior British diplomat on the island, demanded that Barghash step down. Barghash ignored Cave’s order, and instead began to fortify his palace and muster troops. By the end of the day, Barghash had amassed a force of around 3,000 troops in the palace, and had a number of artillery pieces in his possession. He also had an armed yacht in the harbor. The British also had armed ships in the harbor, but these were no mere yachts. 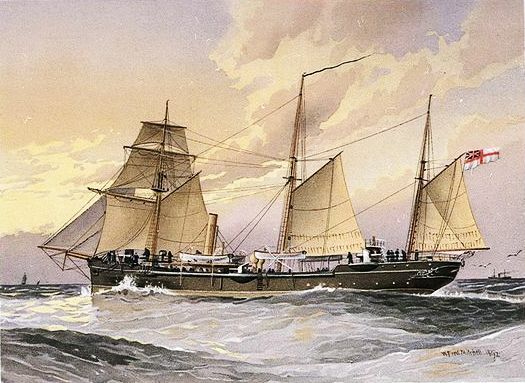 HMS Rush and HMS Philomel were warships, and were armed to the teeth. Another British warship, HMS Sparrow, was called in for backup. Cave, meanwhile, sent a telegram to the Foreign Office in London to ask for permission to use force if necessary. He also sent British troops ashore to protect the British embassy, and to check the danger of the local population rioting. In addition, Cave sent Barghash another ultimatum, which was ignored. The next morning more British reinforcements arrived: HMS St George and HMS Racoon entered the harbor. Things were not looking good for Barghash, but he remained defiant. Cave also got a reply from the Foreign Office in London, authorizing him to take whatever steps he thought were necessary to resolve the situation – including the use of force. He issued a final ultimatum to Barghash, giving him until 9 AM on August 27 to vacate the palace. At 8 AM on the 27th, Barghash told the British that there was no way he was leaving the palace, and that was the last they heard from him. The British warships were at this stage all in place for a naval bombardment, so all they had to do was wait until 9 AM to see if Barghash really was serious. At 09:00 Khalid bin Barghash’s banner was still flying from the ramparts of the palace, so Cave gave the order to attack. 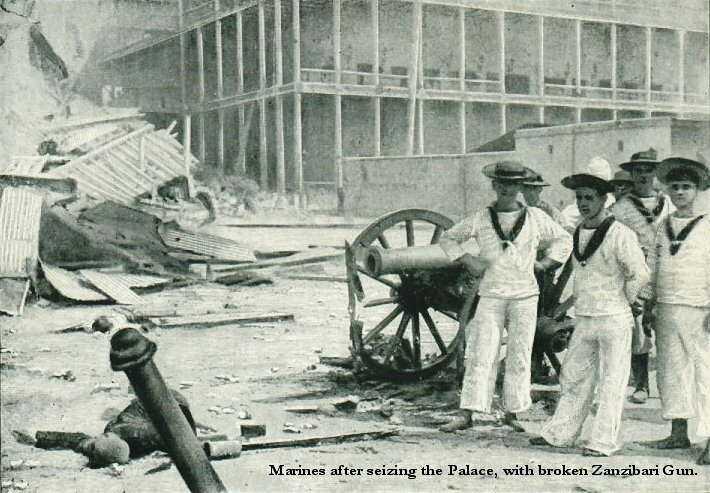 The Anglo-Zanzibar War of 1896 had just begun. The five British warships pounded the palace in unison, and after two minutes of bombardment had taken out most of the defenders’ artillery. Barghash fled at this point, leaving his men to continue the defense on their own. After another few minutes of bombardment with high explosive shells, much of the palace had been obliterated, and around 500 of Barghash’s troops had been killed. 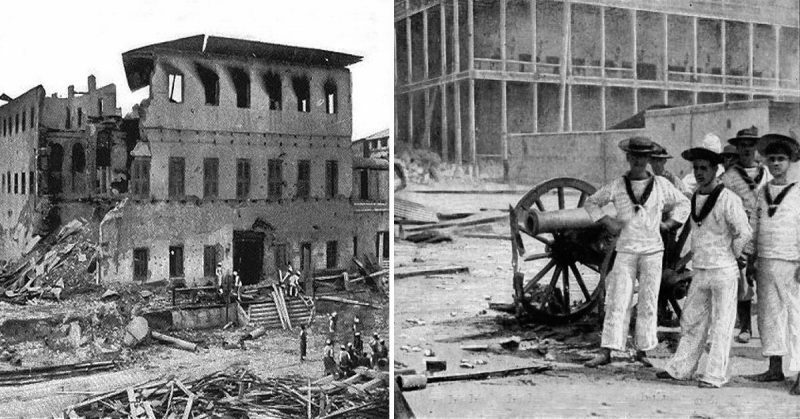 At 09:38 Barghash’s flag was lowered, and that was that – the Anglo-Zanzibar War was over. 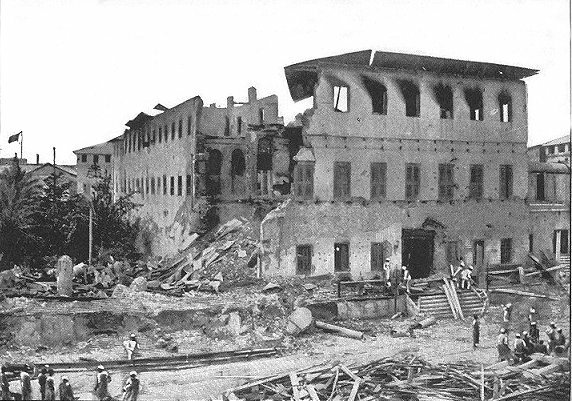 The British suffered one injury and no deaths, while on the other side over 500 of the rebel sultan’s troops had been killed, and most of the palace destroyed. Khalid bin Barghash escaped the country with the aid of the German Navy and was taken to safety in Tanzania. The British installed another puppet sultan, who “ruled” peacefully over the territory for the next few years, and soon the shortest war in history was but a memory in both Britain and Zanzibar.